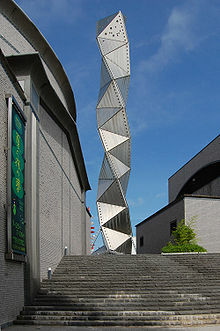 Arata Isozaki (磯崎 新, Isozaki Arata; born 23 July 1931) is a Japanese architect from Ōita. 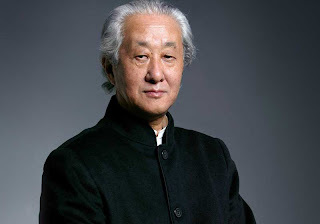 He graduated from the University of Tokyo in 1954. 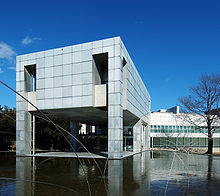 Isozaki worked under Kenzo Tange before establishing his own firm in 1963. He was awarded the RIBA Gold Medal in 1986. Born and educated in Japan, Arata Isozaki often integrates Eastern ideas into his designs. For example, Isozaki wanted to express a yin-yang theory of positive and negative space when he designed the Team Disney Building in Orlando, Florida. Also, because the offices were to be used by time-conscious executives, he wanted the architecture to make a statement about time. Serving as offices for the Walt Disney Corporation, the Team Disney Building is a startling landmark on the otherwise barren stretch of Florida's Route I-4. The oddly looped gateway suggests gigantic Mickey Mouse ears. At the building's core, a 120-foot sphere forms the world's largest sundial. Inside the sphere is a serene Japanese rock garden. Isozaki's Team Disney design won a prestigious National Honor Award from the AIA in 1992. • New Concert Hall Building, Thessaloniki, Greece, 2010.